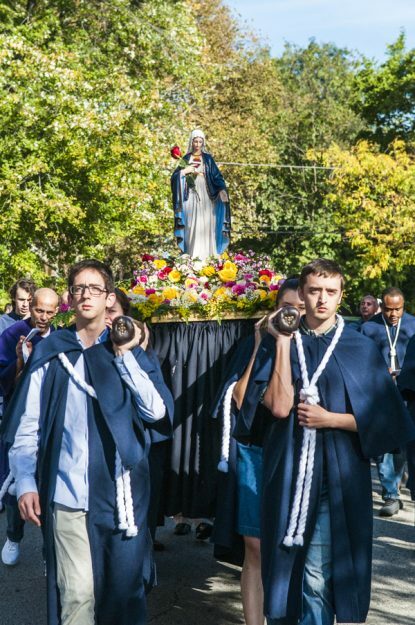 For the fifth straight year, a Marian procession including 125 participants from St. Agatha-St. James Parish and the Penn and Drexel Newman Center publicly witnessed to the Catholic faith in West Philadelphia on Sunday, Oct. 21. The procession wended through the neighborhoods of Mantua and Powelton Village, through the Drexel University campus and down Locust Walk on the University of Pennsylvania campus before ending at the oldest church west of the Schuylkill, St. Agatha-St. James, entering the church to a shower of rose petals and Marian hymns. Among the 480 faithful packing the church for a special Mass were 14 people who made a consecration to the Blessed Mother and over 100 Penn parents, who were in town as well for the university’s Family Weekend. The Mass celebrated the 125th anniversary of the Newman Center — America’s first Catholic club on a secular university’s campus, at Penn. The event brought together the many ministries of St. Agatha-St. James to honor the Blessed Virgin Mary, and was aided by more than 20 volunteers feeding 200 people. It offered a way to deepen people’s understanding of what devotion to the Blessed Mother looks like. “The Marian procession was amazing!” said a joyful Father Carlos Keen, parish pastor and chaplain of the Newman Center. With his endearingly way of calling the Blessed Mother “Mom,” he called the procession “beautiful and moving.” But the most important experience for him “was of our Mom calling all her children to be united, to be family. She is calling each one of us,” Father Keen said. “She is our mom and she doesn’t like to see her children divided, ignoring each other or angry. She wants us to be reconciled! First of all with God, having him in the center of our lives. But also with ourselves, accepting ourselves with the God-given dignity that we have. Also loving each other, generating a true experience of brotherhood and sisterhood and finally reconciled with the creation that God has given us. Deacon Remi Morales emphasized the spirituality of the day, saying, “Mary sees and feels different than we do. What humanly speaking are huge sociological distinctions are nothing for Mary. She sees little children, all equally needed, all poor, all hoping and meandering on our way to Her son. Immediately following the ceremony, a simple luncheon of soup and bread took place in the newly renovated ground floor of the church, located at 38th and Chestnut streets in West Philadelphia. The Penn and Drexel Newman Center’s director, Patrick Travers, welcomed parents of the collegians and kicked off the 125th anniversary year of the Newman Center. “We really feel blessed to welcome college students into our parish community for these critical years in their lives, knowing that they leave behind families and communities and often experience a lot of stress and loneliness in college,” Travers said. “We want the parents of the students we serve to also feel themselves a part of our family, so the Marian procession and luncheon were a great way to show them that faith and community are what are so important to us. “We are very proud and in debt to our long tradition here at the Newman Center and are looking forward to continue helping from young Catholics to be missionary disciples and future Catholic leaders,” he said. A rich and diverse parish situated on the edge of West Philadelphia at the heart of University City, young and old came together for many reasons to celebrate. St. Agatha-St. James is in a period of transition as the Newman Center building was recently sold. In addition to the updated lower level of the church, the building that formerly housed St. James School, located behind the church, will be renovated with some help from the Archdiocese of Philadelphia. It will become the new Newman Center by August 2019 when the new school year begins. Carmen Sanchez, a long-time parishioner of St. Agatha-St. James and actively involved in hospitality ministry, said even those people not in the procession who were busy in the kitchen preparing the luncheon felt the blessings of the day. “On Sunday morning during the business of prepping for soup, I actually told myself to pause,” Sanchez said. She watched other volunteers working in the new kitchen preparing the soup and chatting amiably as they worked. “I felt blessed and happy,” she said. Next year’s procession will take place next October, but in the meantime, St. Agatha-St. James invites everyone to join in upcoming community events at the parish such as “Carols By Candlelight.” To learn more about the parish’s services and programs, visit the website SaintsAJ.org.